Our daughter and I keep having a lot of fun with the HPI Q32, running little "races" in the living room, at my dad's place. 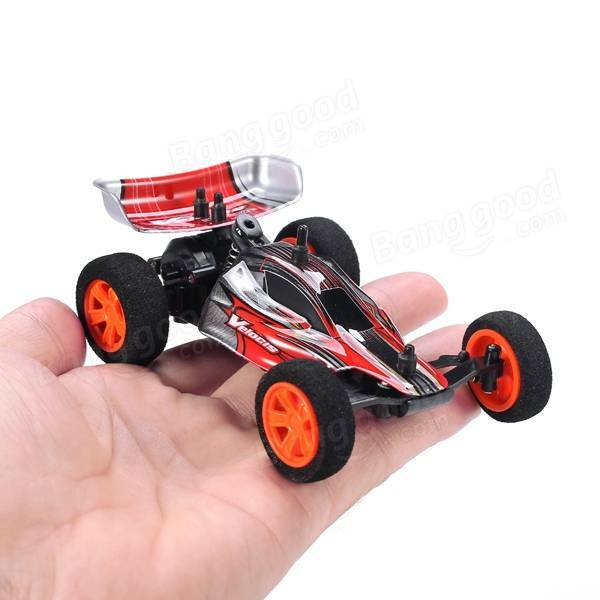 When made attentive of the Velocis 1/32 micro car, I wondered if these would be good fun too. Luckily Banggood was willing to send me a pair of these, to have a closer look at. Cars are being ordered now, and will soon be in transit. Review will continue when the parcel has arrived. Disclaimer: I don't get paid, or in any other way make money with reviews like these. Product specifications and quality may vary at the manufacturer's discretion, and are beyond my influence. I cannot guarantee you will get a product that performs exactly the same as seen and described in this review. There is always room for a general discussion on the reviewed item, feel free to comment, but if you are planning to add a long review instead of some summarizing remarks, it would be appreciated to put these in a new review topic. And please, no affiliate links! A bright red led, showing the car is powered on, and the antenna. No steering trim, this is adjusted mechanically, on the car. Now that we know what the car looks like, how does it run. Well, the throttle is proportional, so that's a good thing. However, the steering isn't, it's just full left, full right. Big disappointment, and when comparing with the HPI Q32, loses some big point here. The speed isn't as fast, but gets much better if you advance the throttle trim 2 clicks forward. However, this also reduces reverse speed, or even makes it so slow, that it won't run in reverse at all. Also, the throttle is auto calibrating, so leaving the throttle trim on a few clicks forward of centre, will not have any effect the next time the car and transmitter are powered on. So you have to repeat adding two clicks forward trim, to get full forward speed. And even with the trim set to unlock max possible speed, and with my Q32 loaded down with a plastic body taken from another small RC buggy, instead of the stock lexan one, the Q32 has better top speed and acceleration. Another problem are the wheels. These are wobbly, and the foam is also not even thickness everywhere. As result, especially the rear wheels tend to bounce up and down and the car loses some speed and control due to the bouncing. Also, the gears are quite noisy, for such a small car, while the Q32 is very smooth and quiet. The Velocis is a fun, small car. Speed control is good, though having to adjust throttle trim each time you drive, to get max speed, is somewhat cumbersome. The biggest issue is the lack of proportional steering, which puts it a class below the Q32. If you've never driven the HPI, this might seem like an impressively well performing car, but if you have the Q32, the Velocis pales a bit in comparison. It is much cheaper though, you can almost get 3 of these for the price of a single HPI. This saves the Velocis a little. 6 - Suitable for a beginner? The choppy steering will be a bit tricky to get adjusted to, but the proportional throttle is a plus. The car is light, and unlikely to get easily damaged. During testing I've hit a few things, but so far no damage. So the Velocis seems to be suitable enough. Last edited by SoloProFan; Oct 18, 2016 at 01:48 PM. Last edited by SoloProFan; Oct 17, 2016 at 02:41 PM. You're fast to get here. Hope the cars will arrive here just as fast, my "trigger finger" is impatient to get these running in the living room, and see how these hold up to the Q32, which, despite it's simple technology, has proven to be a lot of fun, and very durable too. I order a fair amount of stuff from Banggood, that's how I ran across the Velocis. I've always been happy with my purchase. Knock on wood! Look forward to your review. Added pictures and unboxing report. They look pretty good. At only $20 a piece I might have to grab a couple for my nephews. Also, looks like a few of your picture links are broken. How does it compare to the HPI model? - Steering on the HPI is more or less proportional, especially after the mod I made, to avoid the sudden jump from lower steering angles to full deflection. Velocis steering is bang/bang, full left, full right. This reduces control a lot. - Q32 is faster in acceleration and top speed, even with a heavier than stock body. Also runs more quiet. - Velocis wheels are a bit "wonky" as in, not tracking right, wobbling, and the foam of the tyres has uneven thickness, so the car bounces a little, while the Q32 rolls smoothly and has so much traction, it can even traction roll on carpet. The Velocis doesn't get enough traction due to the bouncing, to get rolling, it just more or less slides through a fast turn. I had some of these when they were sold by BG under a different brand name. Might have been WL Toys, can't remember. Anyway, for a cheap, non-proportional car they run pretty well. I have ordered a couple of the Velocis branded cars now and the idea is to set up a small indoor racetrack and race them FPV with the TX01 cameras mounted. Should be good fun. Mine arrived yesterday. The quality is not as good as the Z301 I bought earlier. Especially the front tyres are very out of round and because this makes the car bounce it also means it spins out easily. The throttle also seems less smooth than the Z301. I can't really recommend these cars. To sum it up, sounds like it's not worth the very small savings. If you want one you should the one from HPI. Fun little car ! Here is a little video of the 1/32 Velocis with a tiny fpv vtx. Cheers ! Last edited by poney56; Nov 22, 2016 at 12:25 PM. Nice! Looks like you had some fun!